Viewed from the parkland on which the Llanilar Show is held, Castle Hill presents a severe, even forbidding facade, just as it has for 200 years. At first it was a plain three storey, five bay box with coach house to the west. In the mid 19th century it gained an Italianate servant’s wing and bell tower. The only noticeable modification in the last hundred years is the stone stairwell, built in the 1960s onto the east end of the main block to provide access to the top flat as a separate dwelling. In 1982 I dwelt in that flat, and for the years we lived there we never ventured into the garden on the south side of the house. 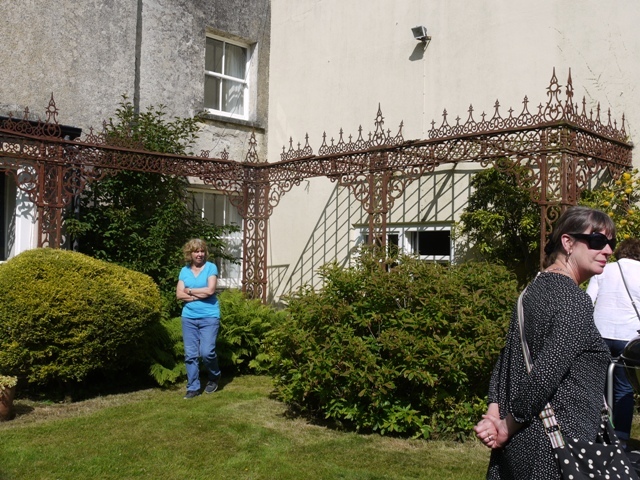 The very elderly Mrs Myfanwy Louisa Loxdale lived in the ground floor rooms, attended by her daughter Myrtle, and the garden was strictly out of bounds. So it was a great treat to see it for the first time this year, on an excursion with the Welsh Historic Gardens Trust. For the south face of the house presents an elegant and cheerful visage, its windows framed in iron trellises, and the entire front ornamented with the elegant tracery of a long cast iron pergola. 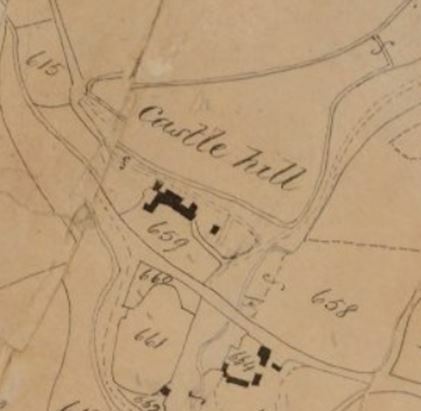 Castle Hill appears to have been built on a virgin site in 1777 by sheep magnate John Williams. Where he lived previously I do not know, but probably further south, his father had been tenant of Strata Florida, and his uncle owned lands at Tregaron. It is speculated that he built at Llanilar because his land here was contiguous with that of the Parrys of Llidiardau. 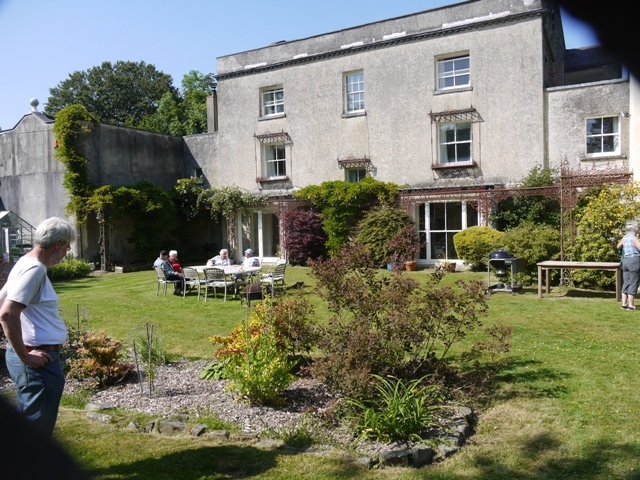 Llidiardau was an important house, home of Thomas Parry the Deputy lieutenant of Cardiganshire. John Williams’s sister Elisabeth was Mrs Parry. John died in 1806, leaving his estate in trust for his son, John Nathaniel, a young child, and substantial provision ( £540 a year) for his widow. As a result the house was available for rent during John Nathaniel’s minority. Thomas Johnes of Hafod apparently leased it in 1806, for Jennie Macve has found a deed of 24 February 1806, in which Thomas Johnes, ‘late of Hafod, now of Castle Hill’, leased out his own home, Hafod to a Lady Rodney. It must have been a short lease, for the Johnes family were in residence at Hafod when the house burned in 1807. 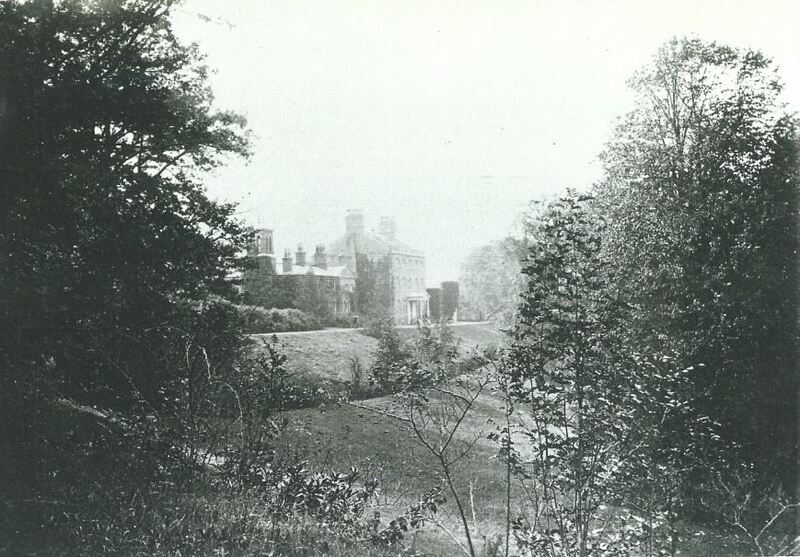 Thereafter they lived at Castle Hill for three years while rebuilding of their ruined mansion took place. It seems to have been a happy time for Mariamne Johnes, who could socialise with the three unmarried Parry girls, Elisabetha, Sarah and Penelope, and many letters survive from the period. Mariamne wrote wryly that her father was less content for he ” takes no pleasure in any situation which does not actually belong to him, which appears to me to be singular, for to me any place that is beautiful affords me the same delight as if I had an actual concern in it”. John Nathaniel Williams grew up to occupy Castle Hill and married Sarah Elizabeth Loxdale of Shrewsbury, but died in 1832, before her, and without issue. When the tithe map and survey was drawn up in 1845 the landed proprietor was the widow Sarah Elizabeth Williams. 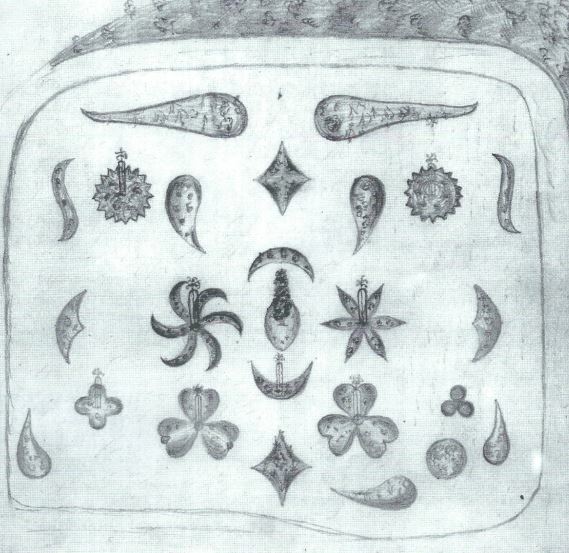 This document indicates the gracious style of Castle Hill, probably from his father’s time onwards. The schedule designates the area south of the house (659) as ‘ Flower Garden’. The 5 inch to the mile Ordnance survey of 1888 marks the area in stippled grey, indicative of a parkland feature, and shows within it a glazed conservatory or glasshouse backing against the wall of the back drive. Today it is an undulating area, mainly of lawn, which slopes from the east down towards the house. A venerable wisteria clothes the pergola, and a sundial stands in the middle of the floor of the former glasshouse, the corners of which are still ornamented with sandstone balls on pedestals. It is not hard to reconstruct in the mind’s eye this gentleman’s garden, with intricate island beds of bright flowers dotted in the scythed lawn (lawnmowers were yet to be invented) and the collection of exotic tender plants in the conservatory overlooking the beds. Since Peter Loxdale’s death in 2017 the estate and farm will pass to his nephew, and at present the occupiers are Peter’s brother Patrick and his wife Susan, who have taken on the huge task of reviving the old house. Like so many other stone houses it was clad in cement render in the early 20th century, in the mistaken belief, prevalent at the time, that an impervious outer layer would make the house less damp. Today it is recognized that traditional lime mortar is a far better covering, since it allows the house to breathe. Replacing the render on the south side, and reinstating blocked and demolished chimneys are among the structural projects in the offing. The top floor, (once our flat) is to be re-integrated into the house, and so the removal of the 1960’s stair wing is even a possibility. Susan is also turning her hand to the garden. Across the road from the present entrance to Castle Hill is the walled kitchen garden, degraded at one side because part of the wall was demolished to provide building stone for the 1960s wing. For much of the past decades it has grown weed trees and brambles, while tenants of the peripheral parts of Castle Hill have made forlorn efforts at gardening the centre. For the first year, Susan has brought much of the garden back into cultivation. It too was probably once grander than it now appears. The tithe and OS map show the south facing north end of the garden to have been of a curving outline, with the land behind it designated “waste ground”. Though no trace remains at the surface this suggests a brick lined fruit wall, perhaps with glazing or rolling screens to protect plums, pears or nectarines from the frost. The gentry houses of Llanerchaeron and Nanteos had such fruit walls, and so did some of the ‘second division’ estates, like Blaenpant. Castle Hill may be seen as a modestly sized, but very classy new-build of its day. Samuel Rush Meyrick in 1810 remarked upon John Williams’ planting of “forest trees and firs to a very large amount”. 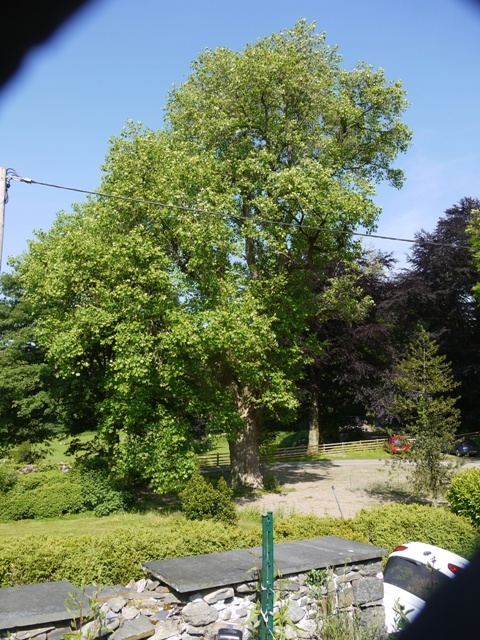 His son, or daughter in law probably added the 19th century exotic trees, a fine tulip tree and a cedar of Lebanon. This entry was posted in Ceredigion characters, Ceredigion past, Parks and Gardens and tagged Castle Hill, Hafod, Llidiardau, Mariamne Johnes, Thomas Johnes by Curious Scribbler. Bookmark the permalink.